Many people don't mind trying anything to improve their skin tone and remove dark spots. One of many available options is to use skinlite cream that reduces melanin production to improve the skin tone. It has steroids inside, which is why it is not considered safe for a long-term use. Keep reading to learn more about skin lite cream and some natural remedies that may produce similar effects. Skinlite cream is a strong and effective pigmentation reducer cream. Since it contains hydroquinone, steroid and tretinoin, it is important that you don't use it without a dermatologist's prescription. The cream works by restricting melanin production, limiting melanin transfer, and speeding skin cell turnover. The cream works quite well when used for a short time, but you may end up getting thin dry skin with acne, irritation, and visible thread veins if you keep using it for extended time. It sometimes also leads to rebound pigmentation. Therefore, you should avoid using it without an indication. The skin lite cream may work in your case, especially during the first few weeks, but it produces several negative effects, so it is important not to use it for a period longer than 2 months. You can also use hydroquinone with low potent steroids for good effects – you can use it for about 4 months without having to worry too much about side effects. However, it is important to understand that your skin type will also have an impact on how adverse the side effects are. Some doctors are of the view that you should use skinlite cream at night and apply a good sunscreen in the morning for better results – you can follow this routine for about three weeks. You should, however, switch to a milder melanin reducing cream after you notice some improvement in your color and skin tone – Clearz Plus and Kojivit are a couple of good options here. The prolonged use of these creams won't produce negative effects because they usually contain vitamin C and kojic acid. Used it twice a day but only on freckles and age spots for the first couple of weeks. Used it once a day (evening) only after the first couple of weeks. Started noticing some improvement in her age spots after the first month of use. Witnessed wonderful differences on the freckles after the first couple of months of use. Now uses it once a week. The fact of the matter is that if you're interested in using skinlite cream without having to deal with side effects, it is important that you follow your doctor's instructions. Contact your doctor immediately if you face some issues or have questions regarding its use. Instead of using skinlite cream or another cream with side effects, it is a good idea to try some natural remedies to relieve dark spots. The juice contains vitamin C that has the ability to lighten the appearance of your dark spots. How to Apply: Simply apply lemon juice on your dark spots using a cotton ball. Leave it for a few minutes or until it dries out completely. Wash it off with water. Apply it for at least a couple of weeks to notice changes. Be sure to dilute the lemon juice by adding some water to it if you have sensitive skin. Using buttermilk is an effective way to reduce the appearance of black spots and blemishes without experiencing any burning sensation. It also contains lactic acid that will improve your skin tone and reduce skin pigmentation as well. How to Apply: Add four teaspoons of buttermilk to a couple of teaspoons of tomato juice (fresh). 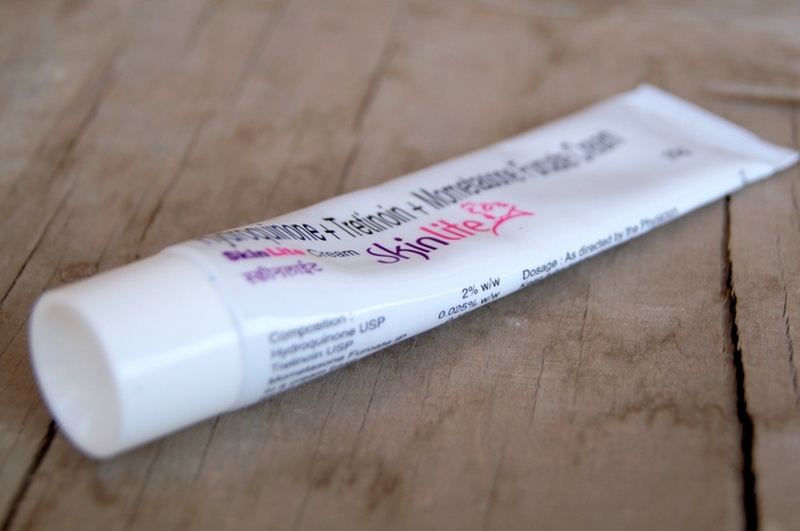 Mix well for a few minutes and apply this paste directly on your blemishes and dark spots. Leave it there and wash after 15 minutes or so. Oatmeal powder can be an effective way of improving your skin tone because it works as an exfoliating agent and helps get rid of dead skin cells. How to Apply: Take half a cup of finely ground rolled oats and add three tablespoons of lemon juice to it. Mix them well to make a smooth paste. Apply it on your face and neck and leave for a while. Wash it off using lukewarm water after it dries completely. If you find it difficult to remove it, you may consider using a clean cloth or towel soaked in warm water to remove the mask. Aloe Vera is another great natural remedy because it has healing properties and works amazingly well to correct dark spots and other skin blemishes. How to Apply: Start by applying Aloe Vera juice on your black spots and dark patches. Now, use your fingertips to massage the affected areas for a few minutes. Leave it there for a while and remove with lukewarm water. Do this at least once a day for a few weeks to notice desired results. It is a great skin-lightening agent and works exceptionally well to reduce the appearance of black spots on your face. You can rely on it to get rid of age spots and sunspots. How to Apply: Take milk, turmeric and lemon juice in a small bowl and mix well. Once you have a smooth paste, apply it gently on your black spots and other affected areas. Leave for a few minutes and then use lukewarm water to remove the mask.